Lad is my main open dog . I received him as a 7 week old pup and did most of his training, however Scott put the first month and a half on him when he was a year old. 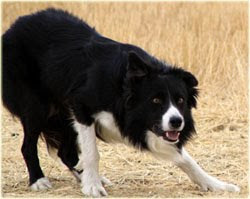 Lad's line on his mother's side is very familiar to me and I have owned more than one dog from that side of his pedigree. His mother, Meg, was bred by Paul Hackett of California and made a name for herself with Tom Lacy, winning more than one open trial. Meg was often in the top 10 in USBCHA points. Now retired, she lives a quiet life with Diana Rollings in Colorado. Karen Lacy (now Thompson) bred Meg to Randy Munford's Vic. Vic is an import who once qualified for the Irish National team. His father was Vic Morris' Mac (a son of Butcher's Mac) who was the 1994 English National winner and the Reserve Supreme winner the same year. 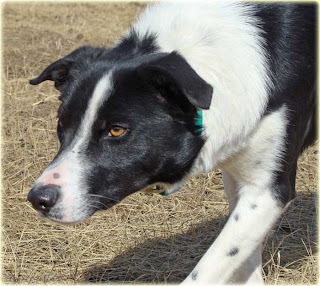 Laddie is an extremely biddable dog, almost to a fault but as his confidence is building and he is getting to know his job better, he can be trusted more and more to make his own decisions. He had a strong nursery year, winning 8 of his classes including a day at the Bluegrass. 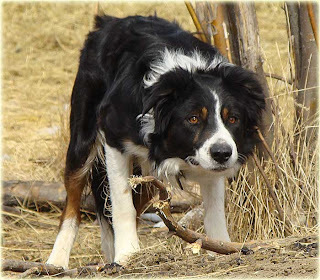 He ended that year with a Reserve Nursery Championship in the Canadians and was also voted the most promising Nursery dog at the 2007 USBCHA Nursery Nationals. Last year was his first year in open and although he was his usual biddable self, his lack of confidence cost him a first round win in the Bluegrass open trial. He often doubts himself on the outrun and lost 12 points that time. He ended up in 10th place in the first round which was very respectable but those lost 12 points would have tied him for first! Lad training in Tehachapi, California last summer. Lad just turned 4 this spring and we have been working on his confidence. Hopefully it will show and he will have a stronger second year in open. 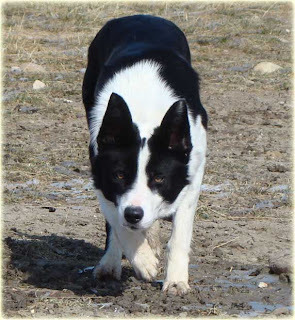 The last but not least of Scott's nursery dogs is Jess. 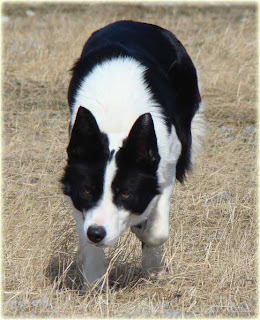 Jess is owned by Terry Sheaffer of Michigan and was bred by Alasdair and Patricia MacRae. Jess' father is Alasdair's imported Nap. Nap and Alasdair have won multiple open trials together and were on the US team at the World Trial last fall. Jess' mother is Alba Lynn - a daughter of Stu Ligon's Nick. 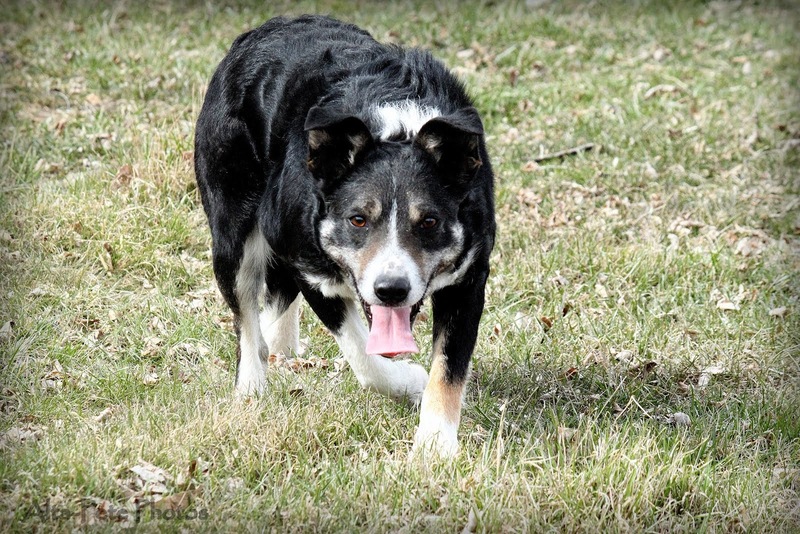 Nick's pedigree is nothing short of royalty in the US trial world. 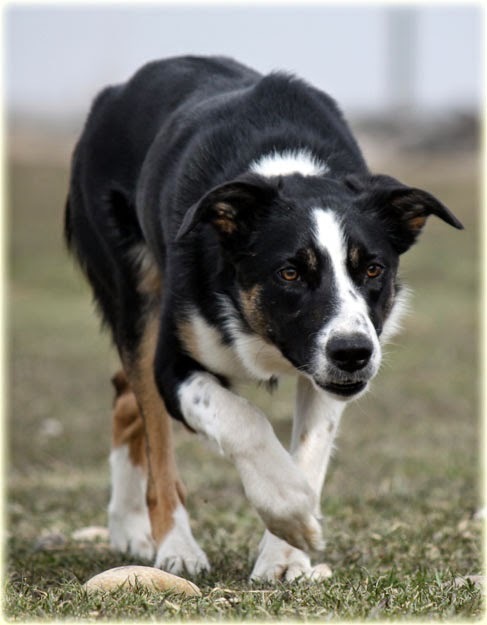 His mother was Alasdair's great Nan, the only dog to win both the ISDS Supreme Championship and the USBCHA National Championship. 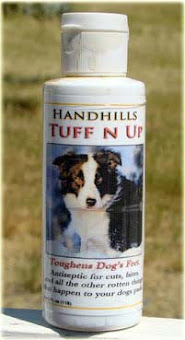 Nick's father was Alasdair's Ben, also a USBCHA National Champion and Nick's littermate is Bill, a 3 time USBCHA Champion. 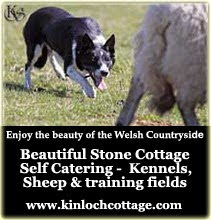 On her mother's side Lynn is a half sister to the 2007 Scottish National champion and the 2006 Supreme brace champion. Lynn herself placed 5th in the 2008 USBCHA Nursery Nationals handled by Tricia MacRae. 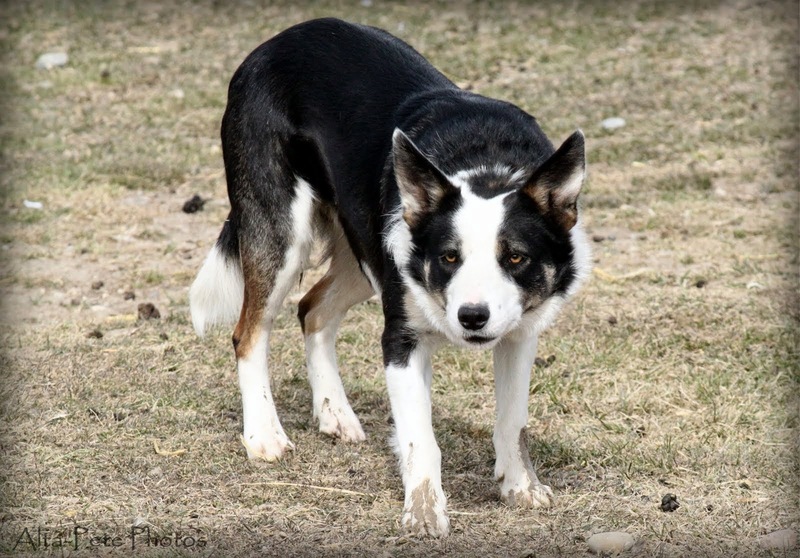 Jess started her training with Scott this winter and has proven to have a good outrun like her father. She will start her trialing career at The Plumb Lucky Trial on April 16th. 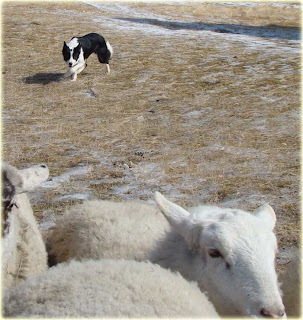 Scott's next nursery dog is River, owned by David Titcomb and Susan Gilbert of Belmoral Shetlands. 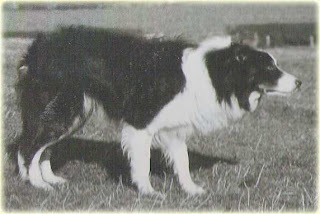 River was bred by Angie Driscoll and Kelvin Broad of Kinloch Sheepdogs when the kennel was located in the English Lake district. 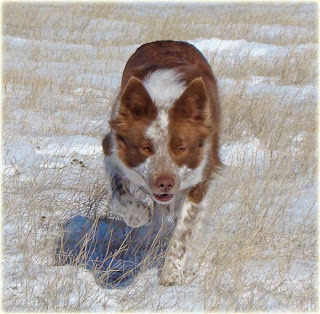 He was was imported by Susan and David to their Wyoming ranch when he was about 6 months old and was sent to Scott this past November for training. 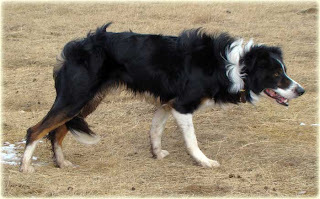 River's mother is Angie's Meg who was bred by Geri Byrne of Oregon. Meg is a littermate to Derek Scrimgeour's Fleece. Angie raised Fleece and Meg together and then gave Fleece to Derek, who went on to place in the top 5 of the 2008 English Nationals with her. River's father is Derek's Bob. 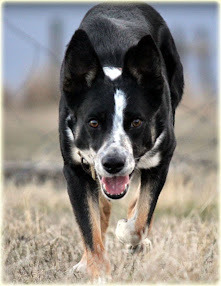 River is a biddable dog who will be making his trialing debut at Thad Flemming's Plumb Lucky Trial in Missouri April 16-19. Well, Maid gets to keep her shotgun position. Although her run didn't score as well today, Scott was over the moon with how she worked. She had it won until the crossdrive when she had some running and lagging sheep and ended up with a messed up line and a panel missed. She had sheep facing her more than once and she walked into them every time with no gripping, which, if you know Maid at all, is a big step for her. Unfortunately, with the second round time shortened by 2 minutes, she ran out of time at the pen and ended up in 10th place for the day. However, she won the overall so we are very proud of her. Lucy looked good today too. She had a missed attempt on the shed that confused Scott but after he got the sheep penned he found that she had a blind one that explained it. She was tied with Roo with a 78. Scott will be giving me the final placings this evening but he did say that 3 of the dogs ended up in the top 10. Tuque looked better today and although the run still wasn't competitive, he was glad he chose to run her. He said she's learning alot with these sheep and smoothing out. Her last run was so much better than her first. She was still having a little trouble with her drive, but a valid excuse was that the crossdrive was the same distance as the open. The best news was that Donnie looked stellar today and handled the sheep well, winning the nursery . I will have the top 10 open and top 3 nursery orders up tonight. Scott said the wind and rain were in your face today on and off. He swore it seemed to come in every time he went to the post but then relaxed when he was done running. Drift did well in his first run today but the second run for the second round of open was not as good. 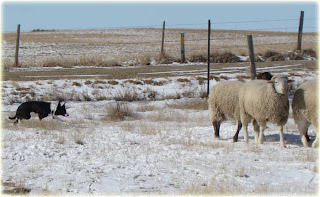 The sheep are pulling hard to the exhaust and at the crossdrive gate the sheep fooled Scott. He thought they would go through but just squirted to the side at the last minute. He did finish his course but with a wide turn around the post and a bad start to the drive, he didn't think they were going to place as high in the second round. Roo was sitting second at the end of the day with a 78 but Scott didn't think it was going to hold that place. He missed a fetch gate today. Maid and Lucy will run tomorrow but currently Lana Rowley and Blue are in the lead. 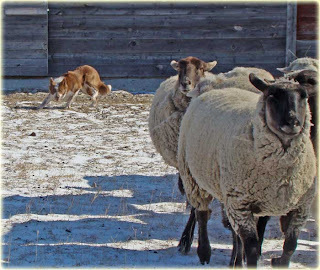 In today's nursery, Scott felt that Tuque definitely handled the sheep better. The sheep kept trying her on the drive and continuing to stop and stare at her but today she walked into them. 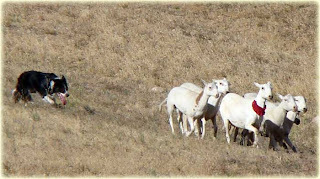 Scott said that it took too much time to get around and at the end the sheep whipped by the crossdrive gates just short of them. Scott saw that they were running out of time and the sheep ran by the pen to the exhaust. They gave him a retire which is not what he actually did but the score wasn't going to be competitive so it didn't matter. He said if the sheep are as difficult tomorrow he might not run the nursery again. Happily, I can report that Don won today! However, Scott said this nursery was a little too hard for his young dogs but he did say that Patrick Shannahan's dogs were handling them well. The first day of Heppner started at 7Am and ran until dark. It was a little windy and cold today with no sun but Scott called it "a nice day for dog trialing." They did not finish all the open runs today so none of my information is final but it is current for the first day. At this point, Maid is in first place with an 89. Scott said she was a little high on her crossdrive but other than that it was a good run. There were very few pens today and Maid's was the first. Lucy was the next to run. He was also happy with her. She is known to be extremely biddable and it's good to know that she carries that into a trial. Her youth was the only thing that got in her way with a wide turn around the post and a missed flank which caused her to miss a drive panel. She also had a rough shed. She came in nicely but Scott said it took a little time to set it up. As of this evening, Patrick Shannahan was in second place but I didn't find out if it was with Riggs or another dog. Roo, I am proud to say, is in third with a 79. Scott said he had a good outrun but got hung up on the trailers. If you ask me, this is because all last year he would cut in on his outruns and make a mess of the lift so he's never seen trailers on the outrun! It's a good lesson for him tho and Scott said that once he was past that he was very very good and alot of people liked the way he was working. Scott said that after 3rd there was a crowd of people in the high 60's and that was where Lucy scored so he didn't know what place she was in. Drift hasn't had the chance to run yet and will go tomorrow. The nursery was a little disappointing but Scott says he has confidence that the dogs will improve on their second go tomorrow. He said Donnie was very good and perhaps he shouldn't have tried as hard to hit his fetch panels as he did. By that time the sheep had been rerun and were pulling hard to the exhaust. Don got stuck into them and didn't have as nice of flanks as he usually does. They did get their first drive leg done but Scott felt the sheep were just too much and he walked off so Don didn't loose confidence. Tuque's run went much the same. She had a very good outrun, despite the fact that because it was dark he was sure she didn't see the sheep when she left his feet. 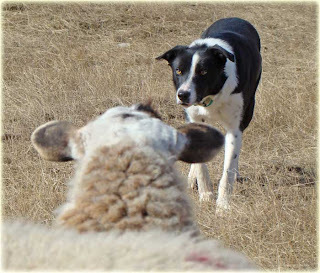 Her fetch was also very good but on the first leg of the drive the sheep started facing her and she'd never experienced that before. She was hesitating so Scott left the post to help her out so she'd learn from it. He said he was happy with both the nursery dogs but this is just a very difficult trial for a first time out. Actually, he was happy with all the dogs. If can get him to call in tomorrow at the end of the first trial I will post in the afternoon but otherwise, I'll get another update tomorrow night. Yea! The first trial of the year! Boo-hoo! I don't get to go! Scott left today for Heppner, Oregon for the St. Patrick's day trial. 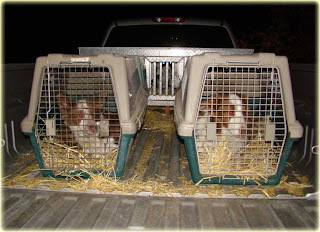 Lucy and Roo waiting in their crates in the truck to leave this morning. 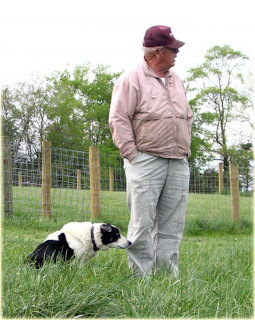 We still have some customer dogs here at our farm that are finishing up training and Scott likes to do a clinic at the end of this trip at Fido's Farm in Washington State, so I always stay home and mind the fort and dogs. He'll be home in 10 days to finish up training the customer dogs and then we will have 2 weeks left to finish up our trial dogs. 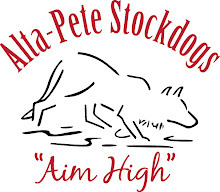 Scott will have a jump on the season by going to Heppner where he can get a feel for how his dogs are working. It's a flat field with lambs to work so it tends to be a very difficult trial. 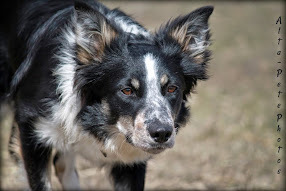 It's not ideal for the first outing of the year but it will let him know what still needs to be worked on and how the young dogs are going to react at their first trial. Last year Scott thought it would be a good idea to sleep in the truck at the trial with only my Hudson's Bay blanket for warmth. After all, Admiral Byrd took one on his expeditions to the Antarctic. But Admiral Byrd must have taken several to the Antarctic because Scott found out he was not near warm enough and picked up a horrible flu. This year he is much more prepared, leaving early this morning and staying in a hotel during the trial. It should make for a much more enjoyable trip. Maid had shotgun as they left because she won this trial last year but shotgun for the rest of the trip will be based on the dog's performances. Maid keeping Scott company on the trip. Scott has promised to give me updates tomorrow night. I will drag what information I can out of him but in the future, when I am at the trials, I promise pictures and scores from the top 10. I can tell you now that at Heppner there will be 53 open dogs and 15 nursery dogs. They are going to run 2 open runs over 3 days and 3 separate nurseries. The judge is Don Helsely from Idaho. 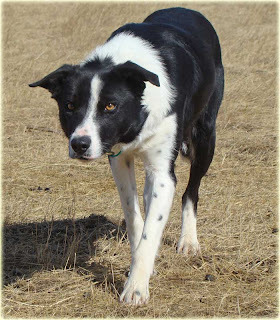 Tuque is the next dog that Scott will be running in the nurseries this year. Of all the dogs she is the most world traveled. She was bred by Geri Byrne of Oregon and is out of her Ted. Ted came from Con McGarry and goes back to Vic Morris' Mac the 1994 English National winner. Tuque's mother is Geri's Lynn who was imported from Derek Scrimgeour and is a daughter of his old Sweep. 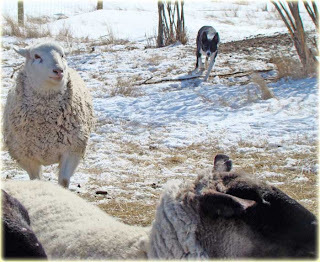 Originally, Tuque was purchased by Angie Driscoll and Kelvin Broad and was brought up to Alberta, Canada to live with them. However, shortly after purchasing her, Angie and Kelvin moved to the UK. 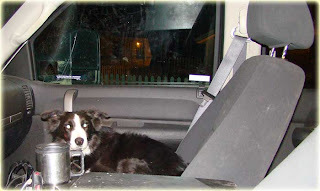 Tuque was too young to go with them and stayed behind with us, coming along on our travels in the US, until she was old enough to travel to Scotland. 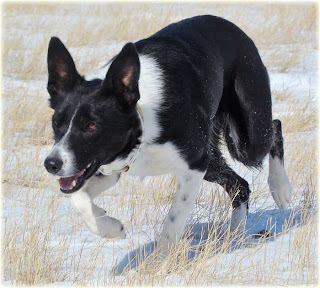 While living across the pond, Kelvin put Tuque's early foundation on her but shortly after, sold her to Susan Gilbert and David Titcomb of Wyoming. So back to the country of her birth came Tuque. 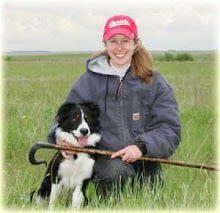 She lived with Susan and David until this past fall when she came to Scott for her winter training. 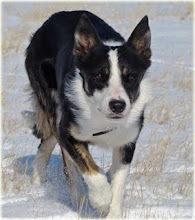 Tuque is a very fast dog and Scott says she melts the snow behind her on her outruns. Because of her confidence and abilities, he offered to trial Tuque for Susan and David for her nursery year. Lucy is owned by Diane Pagel. Scott is only going to run Lucy one time, in the Heppner trial next weekend but I thought I'd better mention her so people will know who she is. 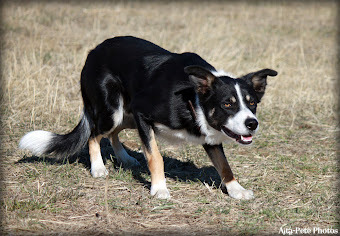 Diane bred and trained her and qualified her for the nursery nationals. She also did a little trialing on cattle. Lucy came to Scott this winter to finish her training and get her ready to compete in open with Diane. Lucy's mother is a daughter of Scott's Pleat and Diane's Tess and her father was a son of Diane's Libbi. Lucy is a very nice and biddable dog. She will return home to Delta Bluez kennels after the Heppner trial to run in open with Diane.